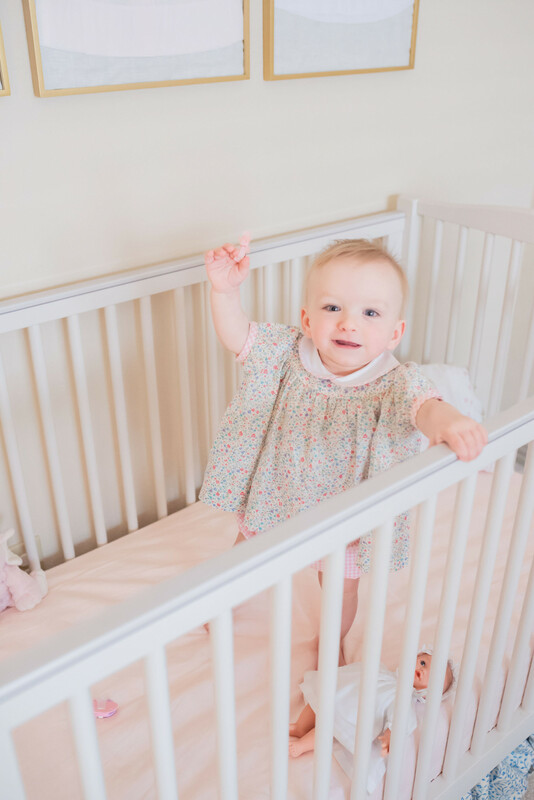 I had so may questions on Instastories about the gallery wall frame I did in Louise’s nursery so thought I would do a quick how-to post and link my gold wall frames. 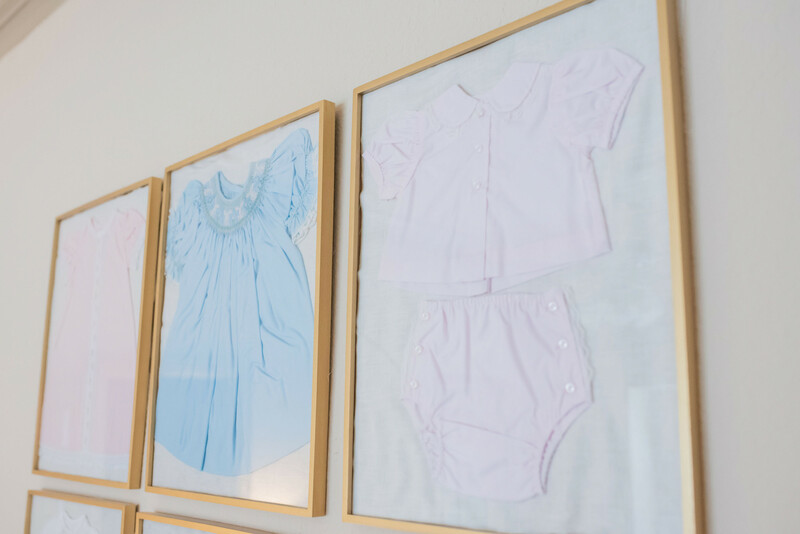 I was looking for the perfect thing to put in Louise’s nursery when I came across my friend Summer Spooner’s Instagram account and saw how she beautifully framed her little girl’s dresses in a gallery type display. Genius! I didn’t want to pay for custom framing on this project so I bought these 11 x 14 frames and took out the mat. I also bought two yards of white linen (it’s really more of a natural color though) from JoAnn Fabric. I spread out the fabric and traced that outline of the mats onto the farbic and cut out. Note: it’s better to cut a little outside the lines than inside because you will be able to tell if the fabric is cut too short. I cut the fabric a little wider and trimmed once I put the back of the frame on, if that makes sense. 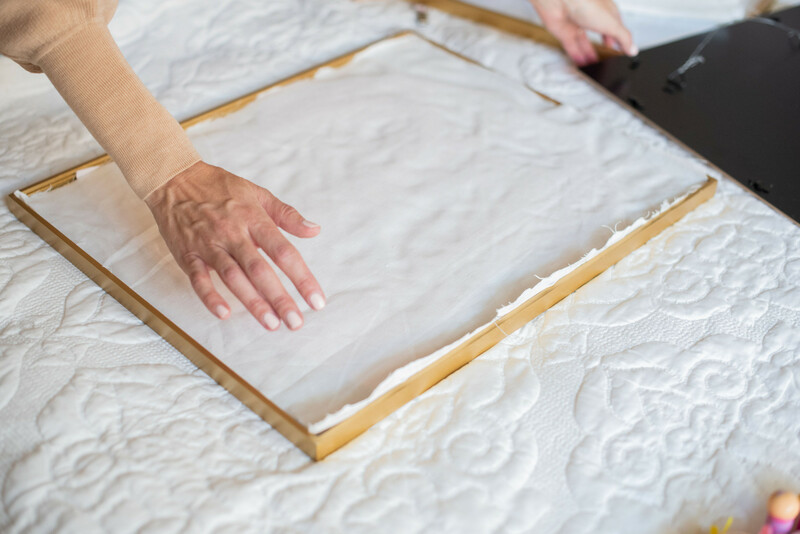 You can also just flip over the sample photo paper that comes with the frame and use that as a the backdrop or don’t use paper. I think you need to use something though; otherwise you need the inside back of the frame. My grandmother made this “coming home” outfit for my oldest daughter and all four have worn it home from the hospital. A sweet friend brought this Feltman Brothers dress to the hospital on the day Louise was born. 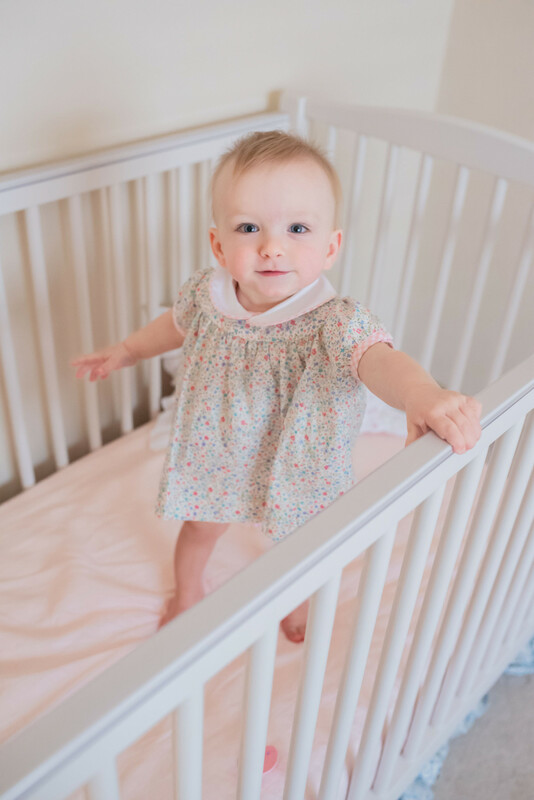 Love this two-piece set from Lullaby Set next to the blue Easter dress my grandmother hand smocked. I wanted to put a blue dress in there to balance out the blue bed skirt. 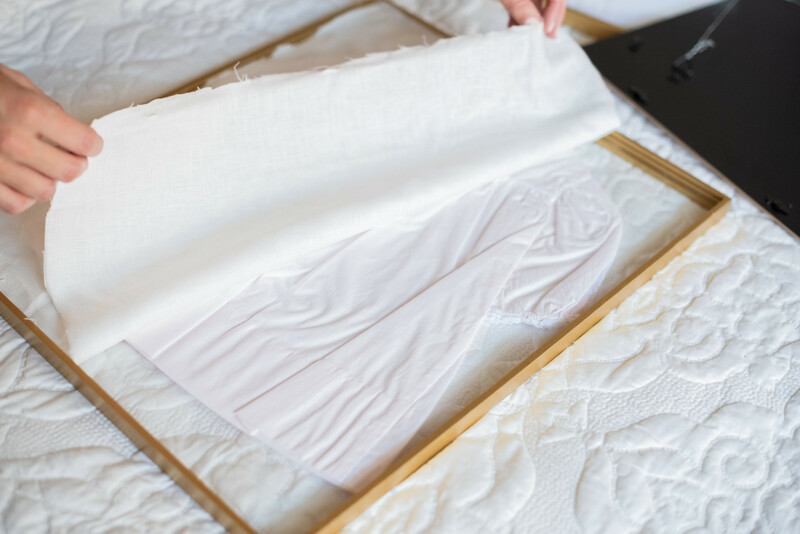 Unless you are just using itty bitty preemie or newborn size clothing, you need to get 11 x 14 frames to make sure there is enough room. Several of the dresses I displayed are size six months and they fit (some I had to fold in the two ends of the dress but you can’t tell). You also want to make sure you hang them high enough where babies can’t reach them even when they start standing up. 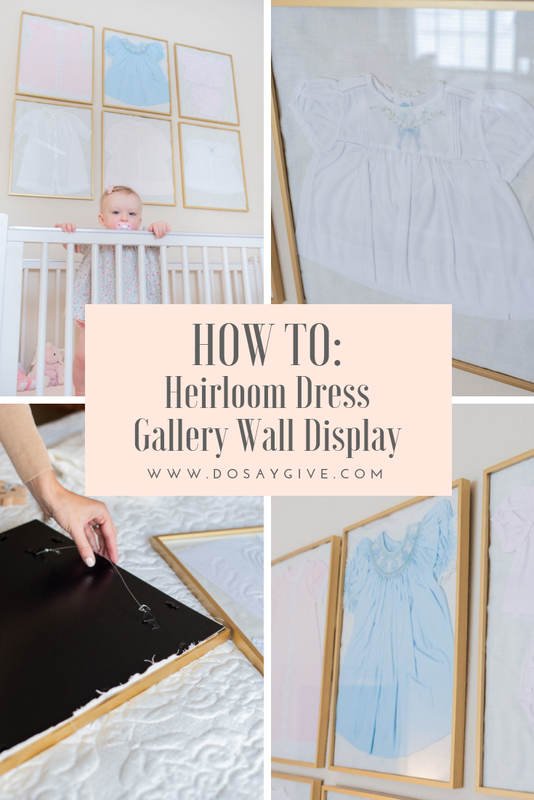 What I learned from this experience is creating a symmetrical and straight gallery wall is for the detail-oriented, which I am not! Even though I measured I still felt had to adjust a little afterwards. Don’t look too closely because you may seem some holes in the wall I haven’t yet retouched! And after these photos I aligned them a little better. Again, this is not my strong suit but wanted to share! 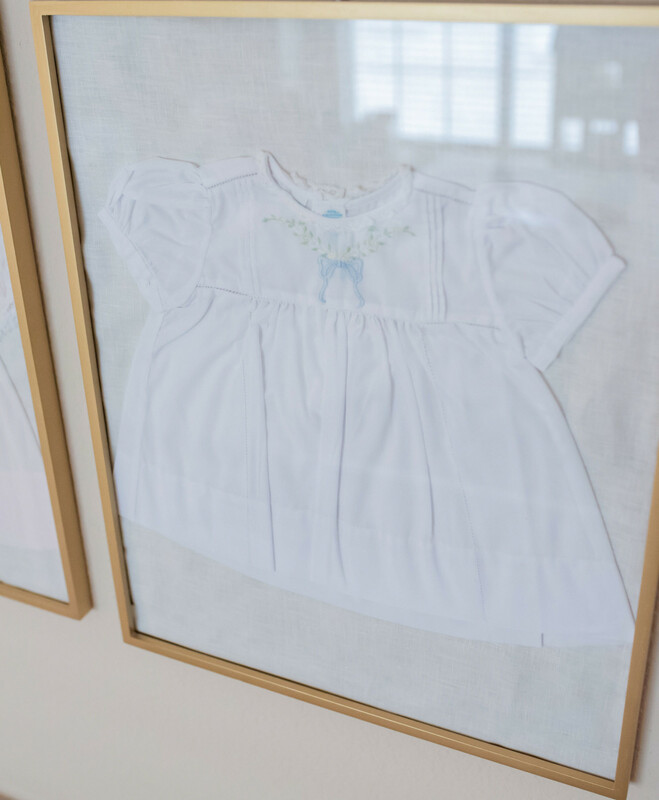 I still have Louise’s baptism gown and Peaches Barnes gown from this post. I think I may have someone custom frame the baptism gown because it is so long. The Peaches Barnes gown she can still wear for a few more years! 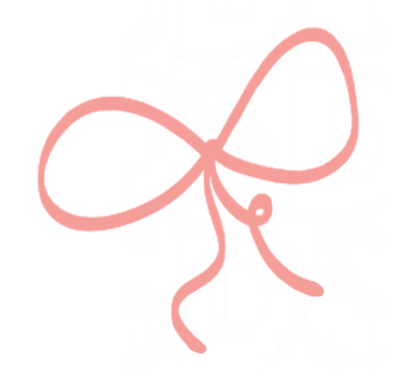 Many of these dresses are brands mentioned in DoSayGive’s Guide to Classic Children’s Clothing. Definitely check that out if you haven’t. I will show y’all the entire nursery soon. It took me over a year to do because, well, she’s a fourth child I guess and I’ve been a little busy. Sorry Ouisie! Thank you!! That means so much! Your wall looks great! 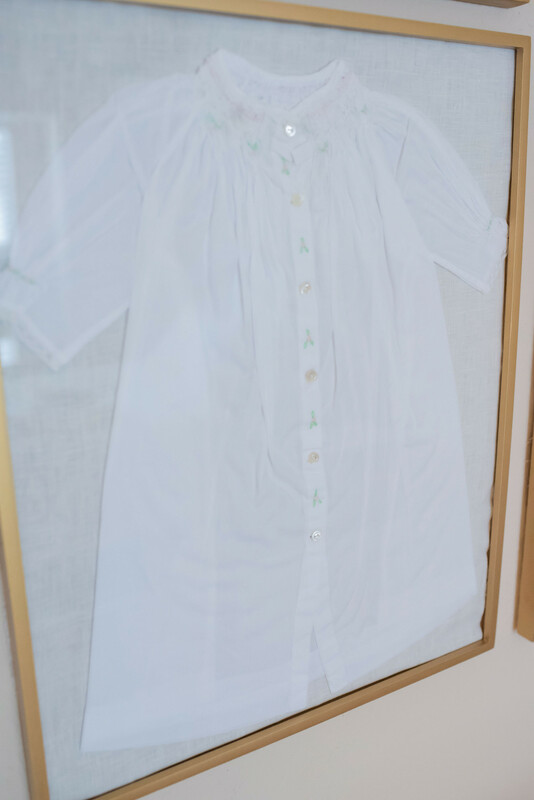 My mom had our baptism gown (made by my grandmother for my 2 siblings and me) framed and it hung in our living room growing up. Fifteen years ago, my mom took it out of the frame for her grandchildren (my four and my sister’s three) to each be baptized in. All 10 names were embroidered on the slip of the dress. Last year we had it reassembled into the original frame and gave it to her for Christmas. Now after a long hiatus, it’s hanging in her house again. What a special thing! I need to remember this! I just found your IG page and blog and have thoroughly enjoyed scrolling through everything during my babies morning nap. We also have four girls (plus one boy) ages 12 month to 11 years old. We have been wanting to get the “baby” her own baby doll for Christmas. I love the bonnet and white dress your daughters baby doll is wearing in the crib. Do you happen to know where I could get the baby doll outfit? Our youngest wears bonnets all the time so it seems fitting to get her a doll with one too. Thank you! It is from Layette Dallas! Call and they can ship! I just found your blog and IG page and have been scrolling and admiring for the past hour. We have four girls also (and one boy), ages 12 months- 11 years. We are wanting to get out baby a doll and I love your daughters baby with the white dress and bonnet in her crib. Would you be able to pass along where it is from? Thank you!